Former Manchester United player and Louis van Gaal assistant manager, Ryan Giggs gets award of Doctor of Science for Outstanding Contribution to Sport. Giggsy said he is proud to receive the award. He suprised to get the award as a footballer he just focus to win matches, trophies and medals, but never thought to stood in front of the audience of bacheloret, wearing the cap and being honoured by a university. He said he was lucky enough to be blessed with a little bit of football talent but what got him through 20 years of playing for Manchester United was hard work. This is his advice to the scholar to be working hard and try to enjoy it, whatever field or occupation they go into. "Not many people receive an honorary doctorate," said Louis van Gaal assistant," so I’m tremendously proud." He added that he had great ties with Bolton: he lived there for a number of years and his kids go to Bolton School, so it’s a proud moment for him and his family. 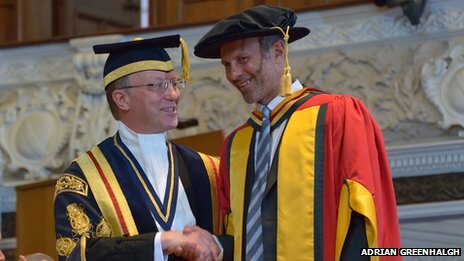 As you could see in the video Ryan Giggs seem a little bit nervous speaking in front of University graduate. Big players as he is will likely to tear apart opponents with his skills rather than do talking. Congratulation Ryan, I as Man United supporter will be patient to see your contribution as United legendary manager.